Hailed by Steve Jobs as a computer “five years ahead of its time”, NeXT, Inc. introduces their NeXT Computer. 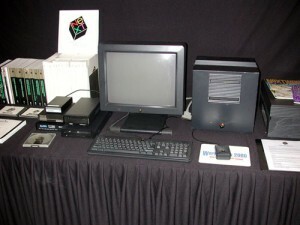 Due to its cube-shaped case, the computer was often referred to as “The Cube” or “The NeXT Cube”, which led to the subsequent model offically being named “NeXTcube“. The new computer introduced several innovations to personal computers, such as including an optical storage disk drive, a built-in digital signal processor for voice recognition, and an object-oriented development environment that was truly years ahead of its time. While not a commercial success, the NeXT Computer and the technology developed for it have a long and storied history. Tim Berners-Lee developed the first world wide web server and web browser on a NeXT computer, crediting the NeXT development tools for allowing him to rapidly develop the now ubiquitous Internet system. After Apple purchased NeXT in 1997, they used the operating system of the NeXT computers to form the base of Mac OS X. Eventually Apple’s iOS, which runs the iPhone and iPad, was itself based upon Mac OS X and hence draws its lineage to NeXT. Finally, the object-oriented development environment that Berners-Lee used to create the World Wide Web is the forerunner of the development environment that today’s programmers use to develop iPhone and iPad Apps. If it wasn’t for the NeXT Computer back in 1988, you may not have your Angry Birds today.